Horse owners are often concerned that their horse can cause property damage or an injury to a third party. This risk poses a financial threat to horse owners because even trained horses can have unpredictable behavior when frightened. This could result in the owner of the horse being sued for damages and injuries. Whether you are boarding your horse on someone else’s property or you run your own horse business, you need to have the right horse insurance in case something unpredictable happens. We have a range of horse insurance policies for you to choose from including horse owner liability, horse business liability insurance, ranch insurance, and many more. You can put your mind at ease when you have a liability insurance policy that will protect you against finical loss if your horse injures someone else or causes property damage. If your horses are not used commercially, your “exposure” is considered “personal.” “Commercial exposure” can be defined by whether or not you have a money-making motive, receive money or other compensation for the use of your horse, or file income taxes reporting horse related income and expenses. Allowing an instructor to use your horse for lessons in exchange for a reduction in boarding costs, or for personal lessons for yourself can be considered a commercial use situation. Assessing your horse activities for commercial use is important when it comes to liability insurance. This is because your horse may already be insured for liability under your Homeowners or Farm Owners Policy, if you have one. However, coverage will depend upon whether your horse is used commercially or not and for what activities. Before buying a Horse Owner’s Liability Policy, you should determine if you are already insured for horse liability. Keep in mind that even if your horse is not used commercially, you may find that some Homeowners or Farm Owners Insurers exclude horses from coverage or may have a limit on the number that can be insured. Your policy may contain exclusions against riding or showing of horses, or taking horses away from your premises. So you should read your policy for horse related exclusions and check once a year with your Homeowners or Farm Owner’s Insurer to be sure its liability insurance applies to your personal horses and activities. If the Insurer will not insure your horses, or you do not carry a Homeowners or Farm Owners policy that includes horse liability, you should purchase a Horse Owner Liability Policy from a specialist [such as Ark Agency]. Let’s consider liability insurance and commercial exposures a little more. If you own full or part-interest in a horse that is used commercially, that is a horse from which you receive money or compensation for its services, your Homeowners Policy excludes commercial activities and will not insure it for liability. A Farm Owner’s Policy provides commercial farm liability so may consider breeding or raising of horses to be an insurable commercial farming activity. While the farm Insurer may be willing to insure a mare or stallion for breeding at your premises, it may not be willing to insure horses for use in lessons, horse drawn vehicle rides, disabled riding, equine assisted services, or racing. It may not insure a breeding or race horse owned in partnership or that is owned by members of a syndicate. Your commercial-use circumstances may require you to purchase a Horse Owner’s Liability Policy to assure proper coverage. How Risky is Horse Ownership? Moderate. As a horse owner and property renter, you may not have access to property insurance for tack, equipment and machinery you own and use. Ark Agency can insure these items by adding a Property Coverage Endorsement to the General Liability Policy. Additional premium is charged for this endorsement and the items and values must be declared in the application process. 1. A gate is left open and your horse gets into the road and is hit by a car, or it tramples the neighbor’s gardens, lawn or field crops. 2. You allow a friend to ride your horse and he or she falls off and breaks an arm or worse. 3. Your horse kicks and injures a third party when you are at a trail ride or show, or it gets away from you and into the roadway causing a car accident. 4. Your horse injures a farrier or veterinarian who is servicing or treating the horse. 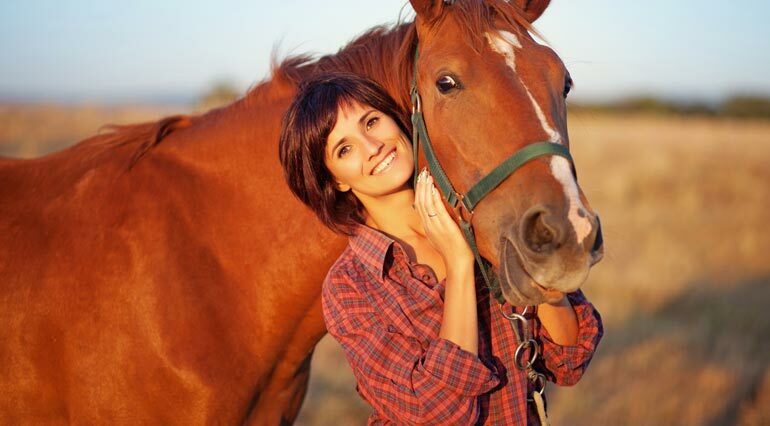 Contact us today if you have questions regarding which horse insurance policy is right for you.